Razer is pretty well known for its gaming peripherals, as well as its gaming focused notebook lineup, so today’s announcement of a new gaming monitor from the company makes a lot of sense. It offers some excellent features for gamers, as well as the premium touch that Razer does so well. The 27-inch display features a 2560×1440 resolution for the IPS panel, and offers a 144 Hz refresh rate. 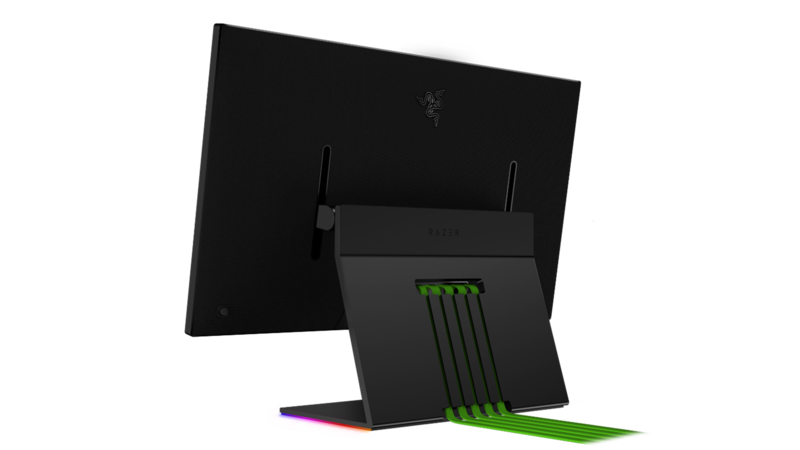 For gaming, response rate is also critical, and the Razer Raptor offers a 7 ms typical response, which can be reduced to 4 ms with Overdrive, and 1 ms with Motion Blur reduction. It features AMD Radeon FreeSync, which just got a lot more useful with NVIDIA’s announcement to finally support it, and coupled with the 144 Hz refresh rate, should offer incredibly smooth gaming under a wide variety of scenarios. The display covers 95% of the P3-D65 gamut and offers a 1000:1 contrast ratio. Razer states that they will offer pre-programmed color profiles in the monitor itself, which is good news for users and hopefully will include a sRGB mode. The display features a picture-in-picture mode as well. Razer has always offered a unique, premium design, and the Razer Raptor definitely follows in those footsteps. The display bezels are just 2.3 mm, and the base of the unit is made from forged aluminum. The backplate is a blend of fabric and metal, and the monitor offers some very unique cable management, with five CNC milled channels to house the five included Razer green cables. As a Razer product, it also of course supports the Razer Chroma lighting, with LED strips to illuminate the base customizable through their software. There’s all of the expected connectivity as well, with USB-C, HDMI, and DisplayPort, with the USB-C also providing power delivery, and two USB 3.1 Type-A ports for peripherals. Razer is expecting the Raptor to be available later this year, with an estimated MSRP of $699.99.